Standard is controlled by an industry organization and not a single vendor Over 150 M Modules are currently available from a number of vendors (Product Directory) Once an instrument or function is selected it may be ported to a variety of backplanes or busses gaining the user platform independence. The simple interface bus makes for easy development of custom functions without the cost of developing VXI, PXI, Ethernet modules. Just buy the appropriate carrier. Instrument vendor development costs are reduced ( 1 Pulse Gen works in VXI, Ethernet, PXI), thereby offering the potential for reducing customer's life cycle costs. Provides for multiple functions in a single VXI, PXI, VME slot. 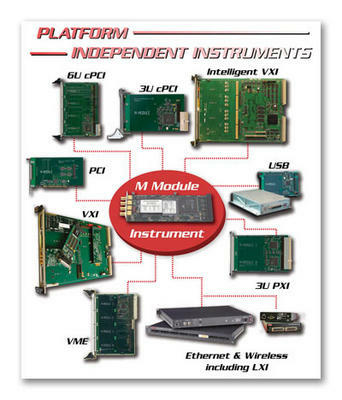 Can provide for hardware traceability between larger VXI factory test sets and smaller PXI or Ethernet field test sets.